The other day I was in the half bath and I just so happened to look up. When I looked up this is what I saw. Can you see it? It is a shadow around the air vent! 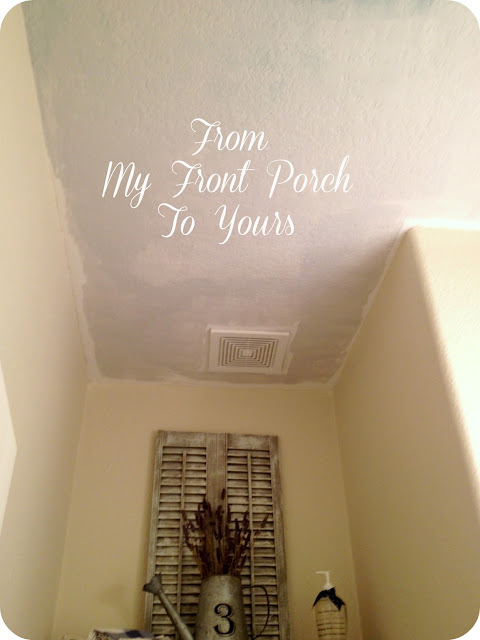 At first I started freaking thinking maybe the ceiling was damp from a leak somewhere but after climbing up on the ladder I found out it was just that the ceiling was faded. I knew that the shadow would bug me each and every time I went in there so I decided to paint the ceiling. First I tried Duck Egg and though I love the color it made the bathroom really dark. The entire reason the half bath got a semi remodel this past winter was because I was tired of how dark it was in the space seeing as there is no natural light. After a few more attempts at mixing some blues and some grays and Littliest popping in every now and then telling me he preferred the white ceiling I finally mixed up a grey I liked. After I painted the ceiling I decided to change things up on the shelves. I brought in my vintage blue seltzer bottle that I purchased a few months back at The Houston Urban Market. I have always admired vintage seltzer bottles so I was super excited to finally find one of my own. 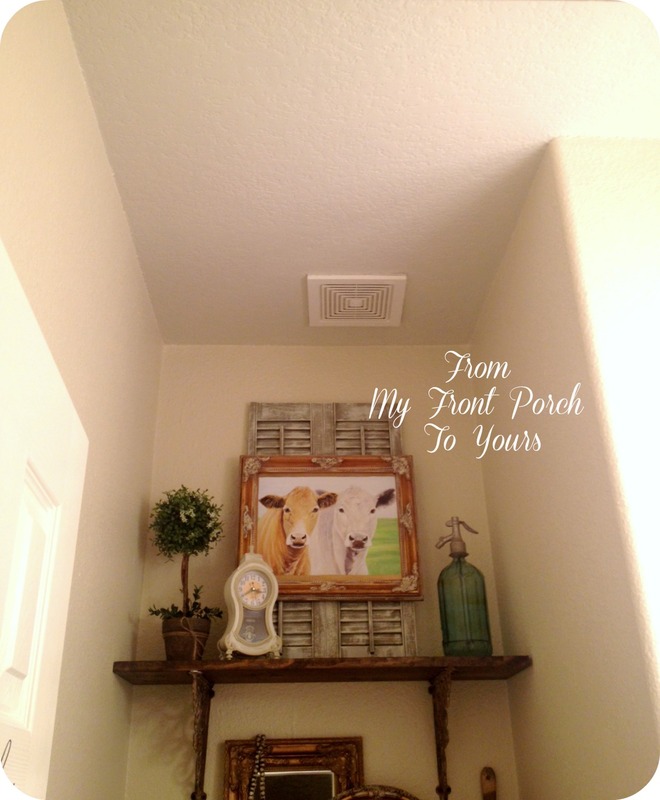 The cows were bumped up to the top shelf as well as the little clock from The Hubster's grandmother. I brought in a few treasures that my friend Brenda gave to me. 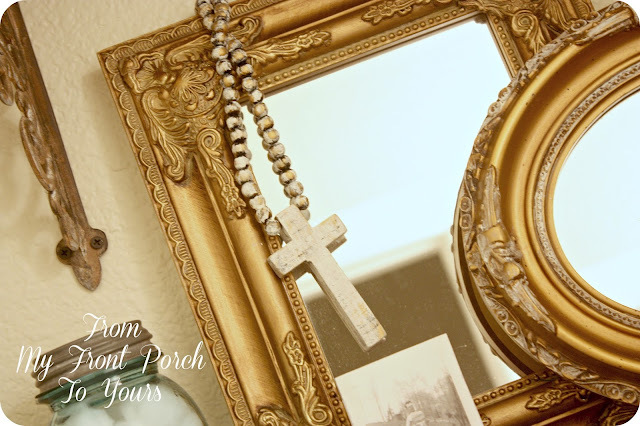 I had been trying to find the perfect spot for the wood bead rosary. I purchased this small boxwood wreath from Holly Mathis at The Houston Urban Market as well. I was thinking of getting two and had two in my hands but at the last minute put it back. I could have kicked myself when I got home and had the perfect spot for two. Oh well, till I find another one it looks perfect right here. It is always so funny how one change leads to another and another and another. 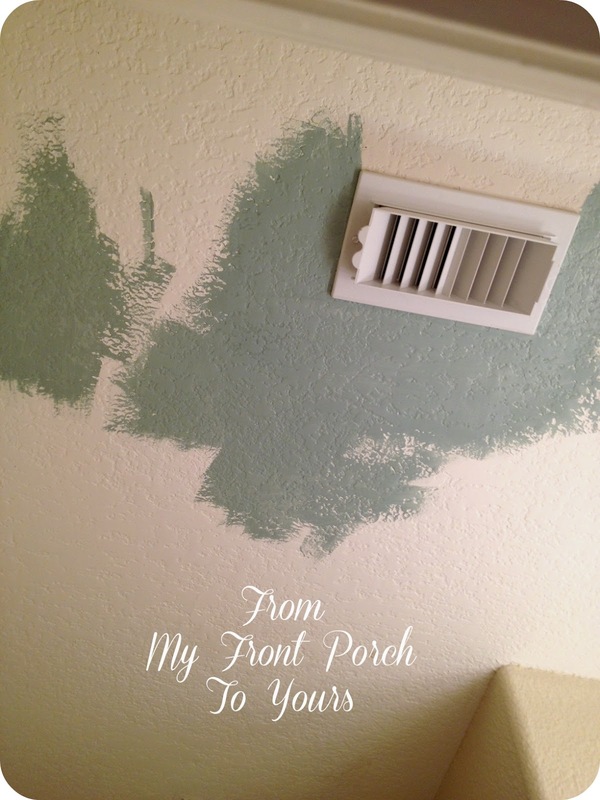 If you want to see what our half bath looked like before the semi remodel you can click here. All I can say is that your powder room has one of the most beautiful vignettes!!!! Gorgeous! 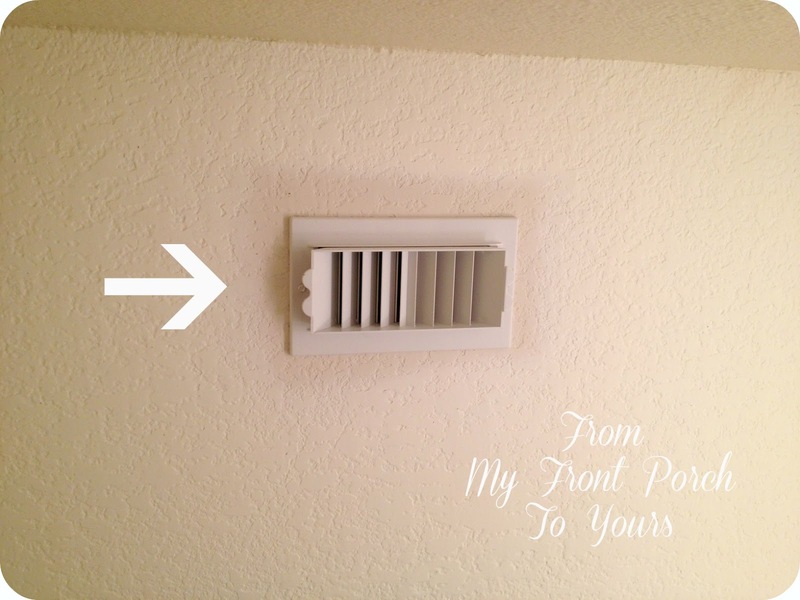 I love how you did over the toilet! 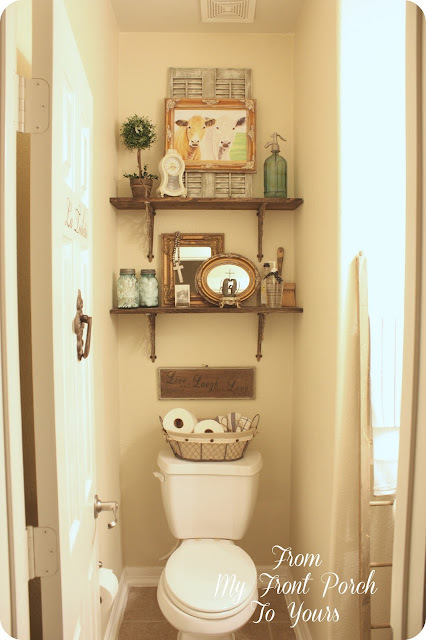 so pretty and interesting....Powder rooms can be so...blah. But not yours! What a luvly powder room Pamela. Luv, LUV the vignette on the 2 shelves.Beautiful. Really cute! I love the cow painting on the shutters! It looks great! Love the layering of mirrors. DEar Pamela, you make magic with your hands.. so beautiful the bathroom.. I love it!!! Oh I love the changes in the powder room. I love those cows too adorable. 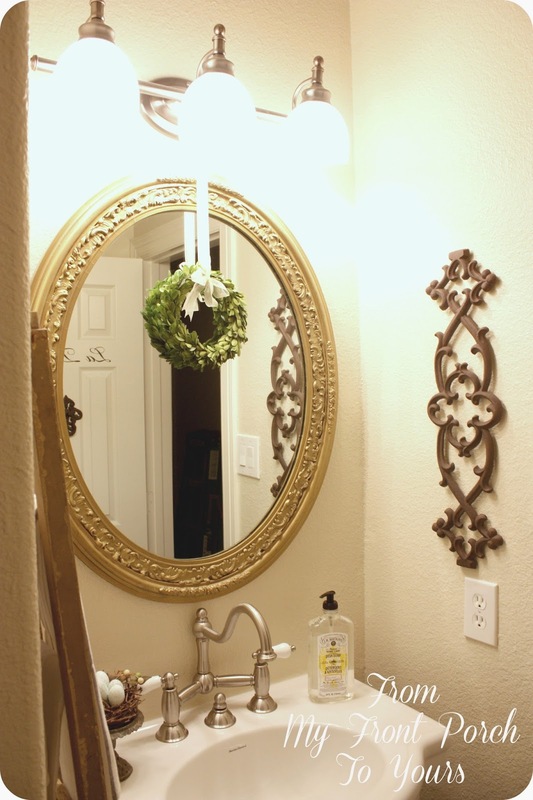 oh, your powder room is so pretty. love the ceiling and all the details. perfection. That is the perfect shade for the ceiling. Love your cow painting. Love the color you chose and the tweaks you did. 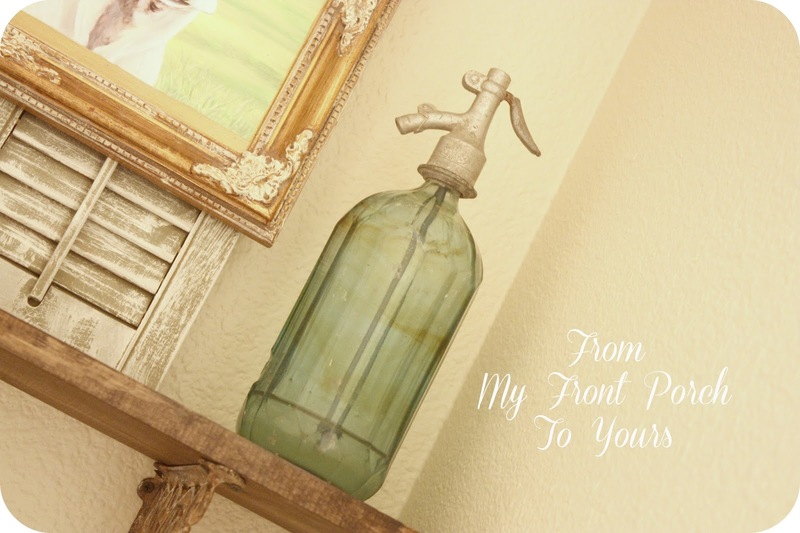 The shutters and seltzer bottle are my favorite! So pretty! 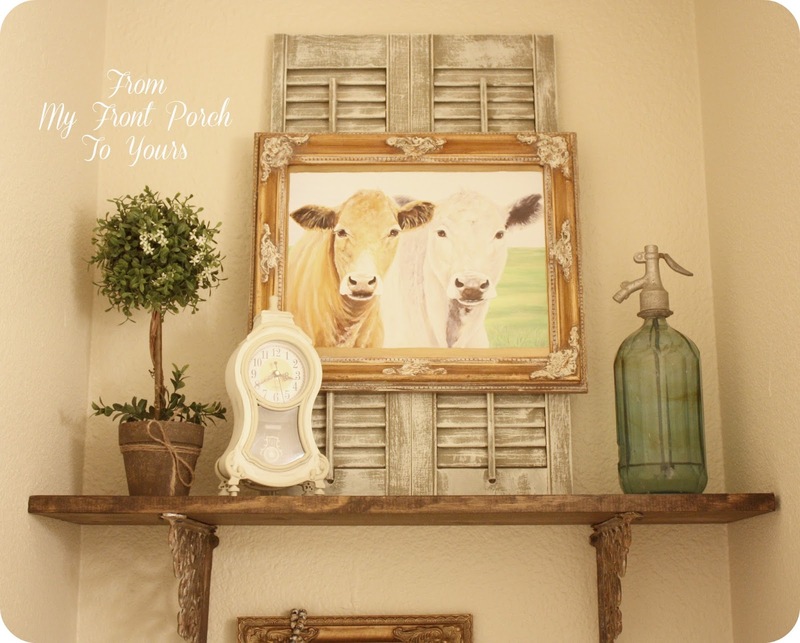 Love your cow print, your shelf vignette looks great! Hope you will add Amaze Me Monday to your party list and hop on over to share! I love Duck Egg, too, Pamela, but I could never do the bathroom ceilings here that color, especially with no windows in these bathrooms. Love how the grey looks. Your shelves look great and it's always nice to fluff things up even in the bathroom. I am loving the space! That cow picture is so cute. I noticed the rosary beads immediately!! 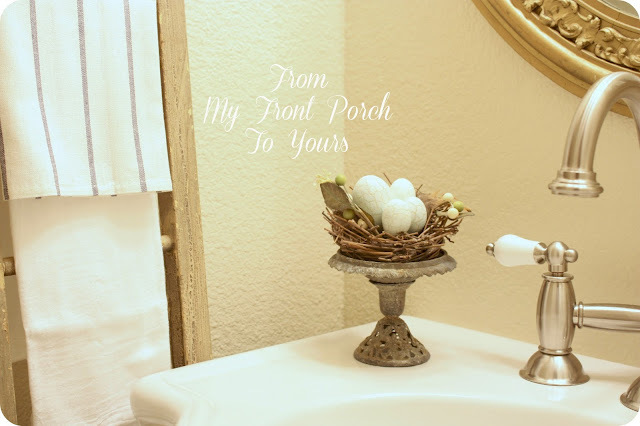 Your half bath is so pretty! 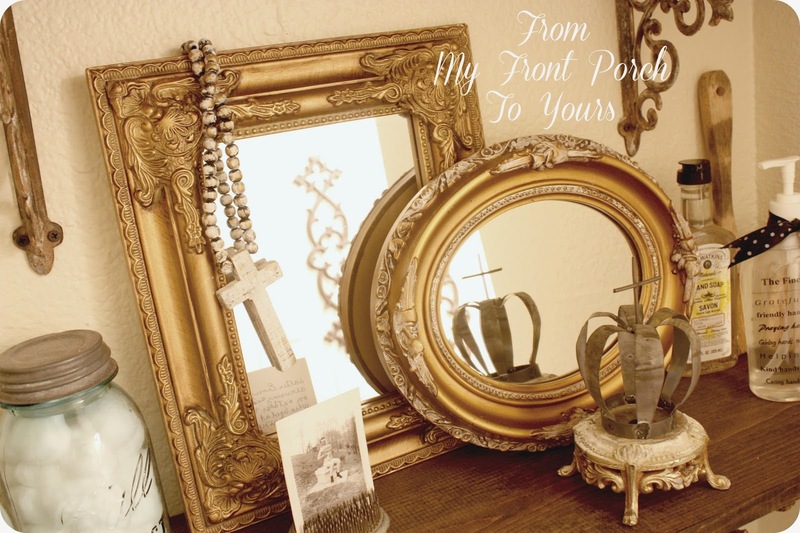 I love how you've styled your shelves. Perfect! we just had our downstairs living room/ kitchen ceiling painted, due to the fact that a couple of months ago I left the bath tub running upstairs and got distracted by something else and so ended up with a flood through the ceiling vents and water stains. We tried to touch up the paint ourselves but of course all ceiling whites are slightly different, so we ended up getting it done professionally. Glad you didn't have a water leak like that. Your little bathroom looks so pretty! your room is lovely. love the gray ceiling even if it is so light. I love the new gray ceiling and if I was in there I would notice. 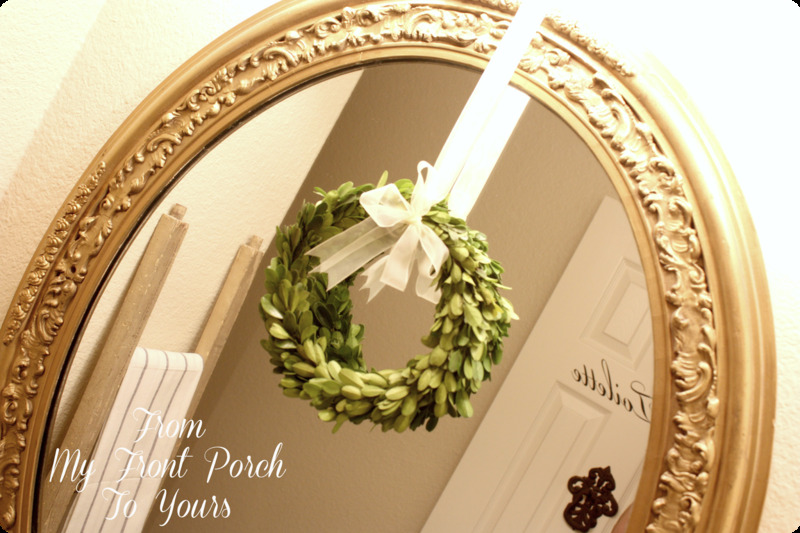 I got three sizes of these same wreaths from Decor Steals and cut away the ribbon so I could improve upon it. But they are so cool so maybe you can get it through Decor Steals. 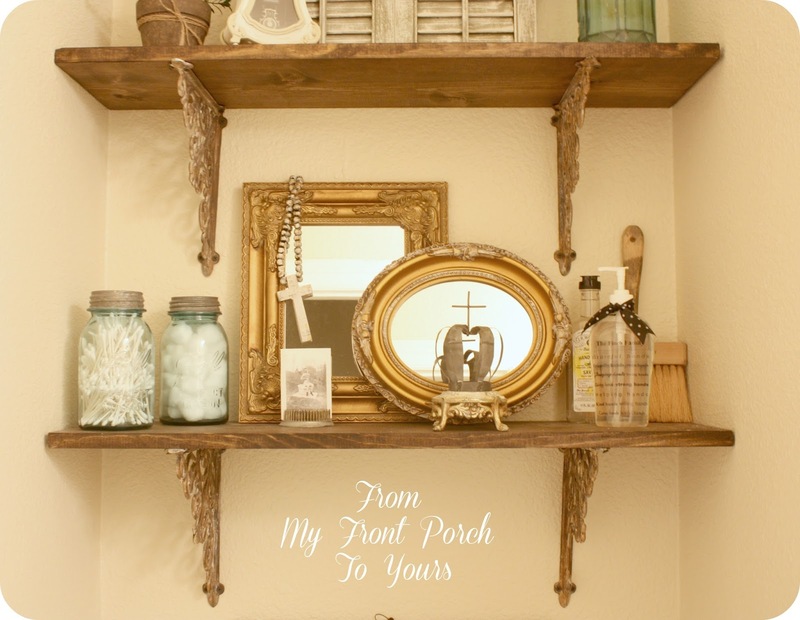 So beautiful, love how you styled the shelves! 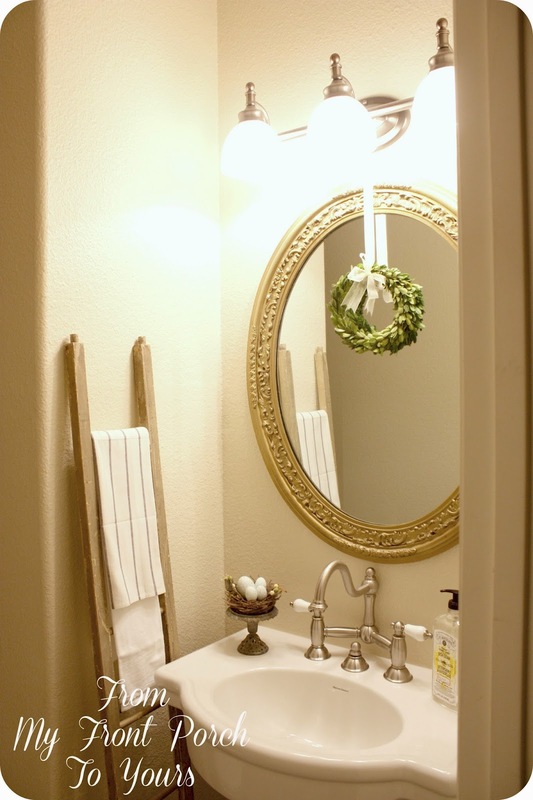 Love the changes in the powder room. That seltzer bottle is really neat and I love the color. I also like the small boxwood wreath. The changes are phenomenal. Gorgeous 1/2 bath.